Time and time again we have heard the phrase, “The customer is always right.” In an era where customer service is so important, retailers and business owners must always remember to keep this in mind. 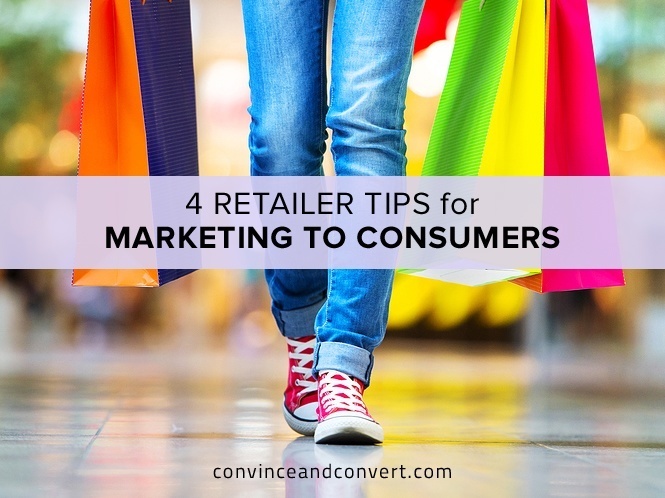 Yet, how can retailers make sure that their consumers are not only getting the message they want to send, but also getting a message the consumer actually wants to hear? It seems simple enough: Send a smart marketing message to consumers, provide a good product, and they will most likely keep coming back for more. Yet, marketing to consumers is not as easy as it seems. It is important to consider a few key things when evaluating customer loyalty strategies. It is easy to discuss how to take care of the customers and give them what they want, yet it is just as easy to lose sight of the business side of things. Retailers need to communicate with their customers, make the purchasing process for the consumer enjoyable, go above and beyond for the consumers, and finally, provide loyalty programs to keep them coming back for more. In order for a consumer to form any relationship with a business or a brand, they need to be able to remember it. A study done by the Harvard Business Review, which included 7,000 consumers from across the U.S., found that of those consumers who said they had a strong relationship with a brand, 64% cited values as the primary reason. If your business wants loyal customers, you need customers to actually care about your business. As a retailer, you should communicate with your customers what you stand for; express why they should choose your brand over any other. Tell your story, be creative, keep customers interested, and keep your brand ingrained in their memory. Wegmans, a popular supermarket chain in upstate New York, New Jersey, Pennsylvania, and Massachusetts, employs a strong set of values to create an environment that sets them apart from the competition. By caring about and respecting their employees and customers, setting high standards, and striving to make a difference they have set themselves up for great success. And with these values—which were handed down from Robert Wegman—they have created “a great place to work where caring about and respecting our people is the priority.” Consumers can feel this in any Wegmans store, and that’s why they continue to shop there. To keep your customers happy, you will want to make the purchasing process as simple and as pain-free as possible. Sell them your product, but do so in a way that they will find enjoyable. When it comes to marketing and advertising, not all words are created equal. Certain words can persuade customers to buy more than others, such as “free,” “new,” and “instantly.” When customers hear these words and their implied connotations, they are more likely to enjoy their purchases than they would have otherwise. The king of online shopping, Amazon, has mastered the art of simplifying the purchasing process. You can find what you’re looking for in just a few clicks, can compare prices from multiple vendors, and even receive free shipping through Amazon Prime. Prices are frequently cheaper on Amazon than most other outlets, to boot. Consumers are frequently returning because it’s a simple and enjoyable process. How else can you keep your customers happy? The premise is simple: Go above and beyond for your customers and be rewarded with repeated business. In a study from the Journal of Applied Social Psychology, researchers found that waiters could increase their tips by 23 percent by the simple act of returning to tables with a second set of mints. What was it about the mints that caused the customers to tip more? The researchers concluded that the mints created the feeling of a personalized dining experience; because of excellent and personalized service, they enjoyed their time that much more. Retailers should take note of this and consider how they can add their own special touch to leave customers with the feeling that the service they received was above and beyond traditional standards. Southwest Airlines is generally thought of as the epitome of customer service in the airline industry. They operate on the vision that they “exist to connect people to what’s important in their lives through friendly, reliable, and low-cost air travel.” Customers can see this vision when they are being serviced, and when they have positive experiences, you can bet that they will want to fly with Southwest again. In just one example, a Southwest customer and her family saw her husband off for a six-month deployment in Kuwait. “A customer service agent saw the family and asked if they all wanted to go to the gate. ‘It bought us thirty more minutes to spend time together,’ (the customer) said. Yet another employee asked if the family would like to go on the plane. The man’s children were able to give him one last hug as passengers cheered.” This not only made the family feel special, but every person on that plane was affected by this moment. Finally, loyalty programs are an excellent way for retailers to market to consumers in a way that is appealing to both the consumer and the retailer. A research study on voting patterns conducted by Stanford University found that people are more likely to participate in something if they are labeled with a positive trait. For instance, the social media engagement agency Buffer refers to their premium customers as “awesome” members and label their upgraded payment plan as the “Awesome Plan”—which, compared to “paid member” or “paid plan,” is an easier phrase to embrace and just plain sounds more desirable. If consumers feel that they are getting their money’s worth for a loyalty program, their loyalty to the brand will continue and potentially even increase. Business owners, take a step back and evaluate your marketing plan. Think about what can be done to improve your tactics to keep customers coming back because your brand has left a memorable mark in their mind. Retailers should be communicating with their customers, making the purchasing process enjoyable, going above and beyond for consumers, and providing loyalty programs to keep them coming back for more. Alon Gamzu is a co-founder of Roundforest, the developer of the E-commerce and big data technology behind Comparaboo. With a Bachelor’s of Engineering and a background in Machine Learning, Alon worked for Intel and Google. Since founding Roundforest in 2014, Alon has helped millions of users enjoy engaging products and technology, delivering big data in a clear and concise way.